Benzene one might explain because it famously stacks in a herring-bone fashion, with the relatively electropositive hydrogen attracted to the π-cloud on the face. Clearly, this explanation cannot hold for cyclohexane, which has no π-face. What does the crystal look like? 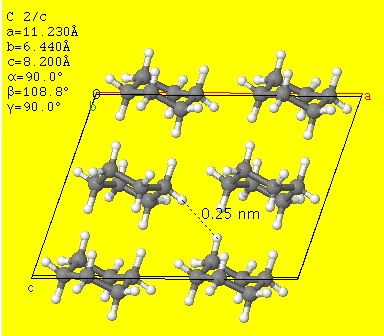 If one inspects the structure closely, one can find quite a few H…H contacts at about 2.4Å and they are arranged in a particularly rigid three-dimensional manner. The maximum attractive force resulting from van der Waals, or dispersion interactions between two hydrogens is thought to occur at ~2.4Å. Perhaps cyclohexane is a prime (possibly THE prime) example of the influence of this (under-rated) interaction? A molecule covered in Velcro no less. By the way, can you spot the connection with the previous post? 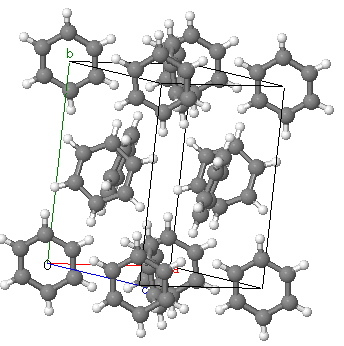 Postscript: Below is a so-called non-covalent-analysis (NCI) of cyclohexane as packed into a crystal lattice. The coordinates are obtained from a neutron diffraction structure. The green regions indicate weakly attractive zones. This entry was posted on Thursday, December 30th, 2010 at 11:02 am and is filed under Uncategorized. You can follow any responses to this entry through the RSS 2.0 feed. You can leave a response, or trackback from your own site. In the present context, it’s unclear to me why cyclohexene and cyclohexadiene can not adopt similar “stacked” arrangements. I will have to think about that for a bit. Thanks Steven for pointing this out. I suspect that since benzene has a fairly strong (non-induced) permanent quadrupole moment, there must be a significant electrostatic contribution from that term. Dispersion forces are supposed to arise from instantaneous induced dipoles (why not also induced quadrupoles?). Are these not of a different nature? 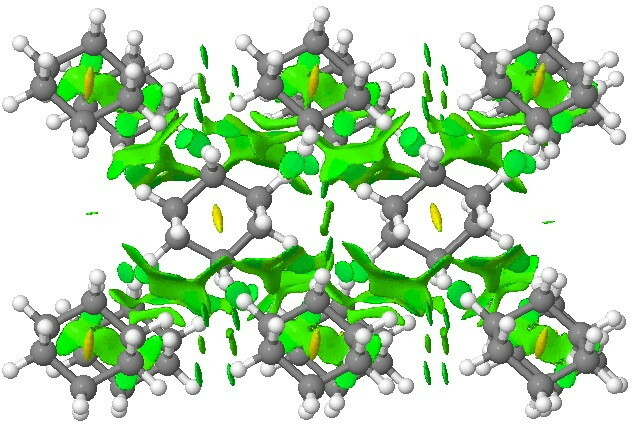 I have found another interesting application of dispersion forces in DNA to be found in this post, which might play a role in the preference of a CG-rich duplex to adopt the Z-helical form. Here is another series, the melting points of the cycloalkanes from n=3 to n=10; -127, -90, -94, +6.5, -13, +14, +10, +10. The jump from cyclopentane to cyclohexane is very striking!